At Knollwood, mission and service are central to how our faith is developed and expressed. Sensitive to Jesus’ call to serve alongside others locally and globally, we seek long-term change through partnerships with community groups and persons. And we find that we are also changed as we join Christ’s work. Some of our efforts have Knollwood’s signature on them; others involve committed partnerships with other groups. All express our desire to be the hands and feet of Jesus in the world. To donate to the food pantry: This month, we are collecting paper towels and household cleaning supplies. Place your donations in marked boxes at Knollwood (Buildings A and B). To volunteer: The Bolton Elementary Pantry is open on the 2nd and 4th Tuesday each month from 1 PM–-6 PM. Volunteers are needed to help set up each time the pantry is open and to assist clients with check-in and shopping. For more information or to volunteer, please e-mail Spence O'Neill at boltonpantry@gmail.com. Let's support our friends at Bolton Elementary School by assisting with some end-of-year events. Volunteers are needed for a breakfast for faculty and staff on Wednesday, May 8; a picnic for tutors and students' families on Thursday, May 30; and the 5th-grade honors program at Knollwood on Friday, June 7. For information or to volunteer, e-mail Trina Jackson or Beth Fields. Blessed are those who hunger and thirst to see right prevail; they shall be satisfied. This ministry team focuses on advocacy and activism for those often excluded from full participation in society and church life. The group has initiated studies and actions focused on justice for those of diverse race or ethnicity, sexual orientation or gender identity, socioeconomic status, and more. This group focuses on improving ministry by, for, and with persons who live with disability or functional difference. Since 2013, Knollwood has been a community partner with Bolton Elementary School. Church members serve as tutors, reading group leaders, special event volunteers, and media center volunteers. Three times a year, Knollwood contributes books to all Bolton students for their personal libraries to foster a love of reading. The Cub Scouts of Pack 911 enjoy bimonthly den meetings, camping monthly excursions and activities, Cub Scout Camp at Raven Knob, and summer day camp. In Cub Scouts, the boys start with their best right-now selves and grow into their very best future selves. Knollwood volunteers tutor children on Tuesdays during the school year at Kids' Café, a partnership of St. Paul's Episcopal Church and the Second Harvest Food Bank's Children's Nutrition Program. Children receive a hot meal and tutoring three nights a week. Many children come from non-English–speaking homes, so Kids' Café is their primary source for homework help. In the spring of 2018, KBC and two partner organizations opened a food pantry for families of Bolton Elementary School students. The pantry opens on the second and fourth Tuesday afternoons of each month at Wesley Memorial United Methodist Church, next door to Bolton Elementary. Running the pantry takes many volunteers. Knollwood collects food weekly and annually for Crisis Control, a nonprofit that assists people in crisis to meet essential life needs. Just before Thanksgiving, the church conducts a big ingathering of food. To contribute, look for donation boxes at church and announcements in church publications. Over 40 members of Knollwood deliver Meals on Wheels on a monthly basis for Senior Services of Winston-Salem/Forsyth County, on a route sponsored by the Winston-Salem Foundation. Some members deliver individually while others go as couples, or with a friend. Additional volunteers are always welcome! In the four coldest months of the year, Knollwood volunteers assist City with Dwellings in providing a women's overflow homeless shelter at St. Timothy's Episcopal Church. Volunteers and homeless guests share stories, eat together, and journey toward a stronger community for all. Volunteer spots are available for early morning work, evening mealtimes, and during the night. Knollwood partners with Habitat for Humanity and others to construct or repair homes for low-income residents in the community. We make an annual commitment to the Faith Build, a collaborative effort with brothers and sisters from other churches, temples, and mosques. Since 2016, Knollwood has supported refugees arriving in our community. Current, five Good Neighbor Teams provide assistance and friendship to families from Syria and the Congo, in partnership with World Relief. Knollwood members also facilitate a local Refugee Advisory Coalition, which works systematically to enhance services. We provide child care while mothers take ESL classes. In the summer, we contribute to a Welcome Week for newly arrived families and recreational activities for refugee families. 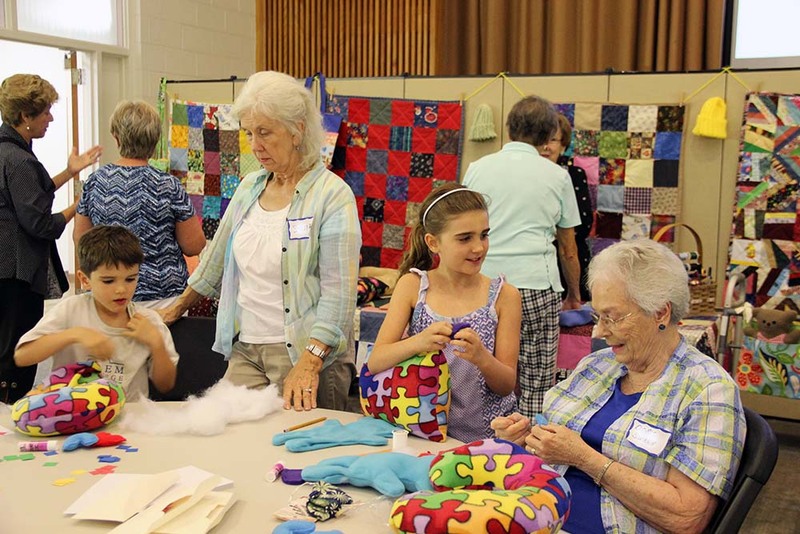 This group of talented church and community members gathers to sew, knit, crochet, quilt, and craft. They provide handmade items of warmth and comfort to the neediest infants, children, and adults in our local and extended communities, as well as overseas. Africa Exchange engages specific marginalized communities in East Africa through integrated child development centers, building local capacities, and promoting conservation of critical ecosystems. Cooperative Baptist Fellowship field personnel Sam and Melody Harrell initiated this organization. 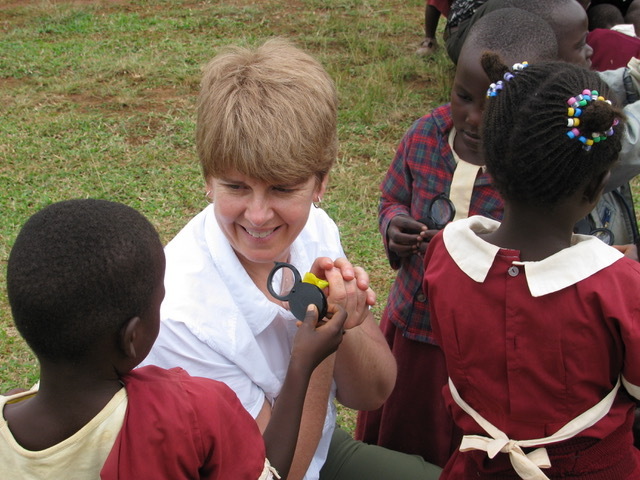 Knollwood members have traveled to Kenya three times to assist and learn from Africa Exchange. Our missions giving supports specific health-care initiatives, especially for children, including parasite treatment, treated mosquito bed nets to prevent malaria, daily nutritional supplements and multivitamins, immunizations, and construction of pit latrines. AMOS is a Christian nonprofit organization in Nicaragua, supported by American Baptists. Led by David and Laura Parajon, AMOS addresses problems of poverty, disease, and preventable deaths by working alongside the residents of impoverished communities as they improve health, education, and development. Evaluations have consistently shown reductions in infant and child mortality and improvements in maternal health in each of the communities in which AMOS works. In addition to our missions giving, Knollwood teams have traveled to Nicaragua to provide hands-on assistance and supplies and to learn from AMOS Health and Hope. Cindy and Eddy Ruble, members of Knollwood, serve as Cooperative Baptist Fellowship field personnel in Southeast Asia. Cindy is an advocate for women and children, with long experience aiding and empowering survivors of human trafficking. She works to create safer communities for all. Eddy is CBF's coordinator of international disaster response during crises such as earthquakes, typhoons, and floods throughout Asia. Both work to bring persons and communities out of crisis into long-term transformational development. We support the Rubles through our mission offerings and learn from them on their visits home. Roy and Rebeca Clifford are Young Life Missionaries working in both the Dominican Republic and Central America. In the DR, Roy has created and manages Pico Escondido, a retreat center for Dominican adolescents, primarily from low-income families, where they may have transforming Christian experiences in camps and retreats. Rebeca provides operational and financial management for Young Life in Central America, while supervising staff working in Panama and other locations. In addition to our missions offerings, teams of Knollwood youths and adults have traveled four times to Pico Escondido, working on projects both at the camp and in nearby communities.